Contrary to what the media tries to make you believe, global climate change is not a major cause of species extinction. A recent study published in March 2019 in Frontiers in Ecology and the Environment shows that the major cause of extinction is the introduction of invasive alien species (IAS) into ecosystems. This phenomenon, well known to biologists and confirmed by the IUCN (International Union for the Conservation of Nature), is unfortunately little known to the general public. Moving from one continent to another, humans have always brought with them a series of plants and animals that were outside their usual biogeographical limits. With the development of international trade, this phenomenon is only growing. For example, within the European Union, the number of EEE would have increased by 76% between 1970 and 2007. Although the ecological impact of most introduced species is unknown or seems negligible, it has been shown that some species introductions have caused substantial changes in ecosystems. These changes often include the disappearance of local species. It was initially thought that these extinction phenomena were exaggerated and that local species could also be the basis of extinctions, and some authors even believe that efforts to control or eradicate introduced alien species would not be necessary possible. However, no one has ever really tested whether introduced species caused more or fewer extinctions compared to local species or other causes of extinction. This question was therefore studied by Tim Blackburn’s team (University College London, UK) in a recent publication of March 2019. For this purpose, they used the global extinctions database provided by IUCN. The researchers selected these 12 criteria and simply subdivided Criterion 8 into two categories: (1) “Invasive Species” (ie, IAS) and (2) “Other Problematic Species” (ie, say local species). 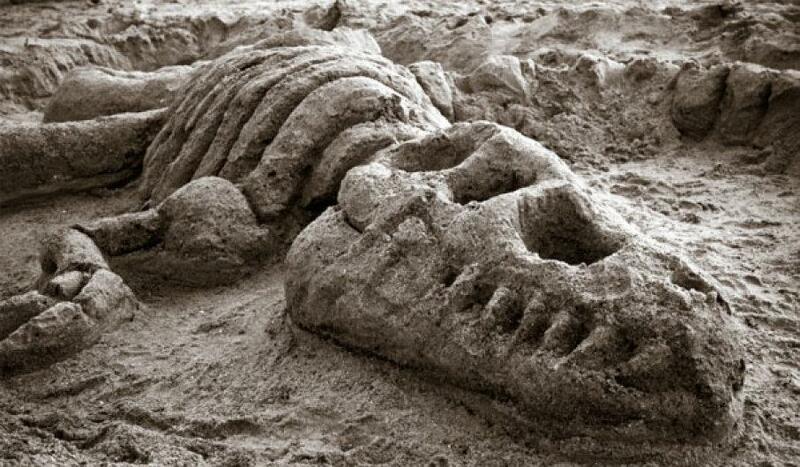 13 causes of extinction are therefore considered. For each extinct species, one or more causes of extinction are indicated. The statistical tests are performed by the authors to determine what were the main causes of extinction. For 782 animal extinctions, 261 extinctions (33.4%) were due to the introduction of an EEE into the environment (Figure 1). Other causes are sometimes associated, such as pollution. For extinct plants, 39 extinctions out of 153 (25.5%) were due to the introduction of an EEE. The EEA actually represent the first cause of extinction for animals, well before the 2e category (hunting and fishing) regarding 18.8% of extinctions. The EEA is also the major cause of extinction plants, 2e because here is the use of biological resources (23.5% of extinctions) and 3e causes agriculture (19.6% of extinctions). Sometimes, IAS was not the sole cause of the disappearance. Most often a 2e issue was involved and was probably in synergy: for example, about 1/3 of extinctions in which intervened EEA (29%) also involved the use of biological resources (cause #5) as 2e disappearance factor. Similarly, about 1/5 of extinctions in which intervened EEA (21.7%) included agriculture (cause No. 2) as 2e disappearance factor. Further details are given in the Blackburn publication. Figure 1. A number of recent animal extinctions (IUCN categories “extinct” [EX] and “extinct in the wild” [EW]) for different groups of animals (figures from IUCN Table 3a). The colors indicate the causes of the extinctions (“Driver”); for example, dark purple is used for EEE (“Alien”), extinctions caused by local species (“Native”) are light purple. The Neither category includes other causes of extinction or unknown causes (source, Blackburn et al., 2019 ). The groups of animals for which IAS is involved in the majority of extinctions (Figure 1) are spiders (Arachnida, 100% of IAS extinctions), centipedes (Diplopoda, 100% of disappearances caused by EEE), birds (Aves, 68.9% of disappearances caused by IAS), and annelid worms (Clitellata, 50% of disappearances caused by IAS). For reptiles, EEE is responsible for 42% of extinctions and the figure rises to 47% for mammals. None of the 935 extinctions is mainly due to climate change. This is also confirmed by other studies on biodiversity loss, such as that recently published by WWF. The major cause of species extinction is not global climate change nor CO2. Species disappear first because of the introduction of invasive alien species. So let us be wary of the alarmist statements conveyed by the media. The lack of link with the global temperature is not surprising: if we take the example of temperate zones, in one day the temperature can vary from 20 °C between morning and evening (for example in the month August). All species are accustomed to these differences. So what about + 0.8 °C in 138 years … or 2 °C more predicted by computer models for the year 2100… Don’t you think that animal and plant species will resist? Humans, however, are responsible for the bulk of animal extinctions, not because of climate change or CO2 emissions, but simply because they change the range of some species (introduction of IAS) but also because of is fishing, hunting, polluting, cutting forests and building roads. This is also confirmed by a recent WWF study on biodiversity. In conclusion, do not put (always) the climate at all sauces, here obviously it has nothing to do with the problem. Gandhi KJK and Herms DA. 2010. Direct and indirect effects of alien insect herbivores on forests and forests in eastern North America. Biol Invasions 12: 389-405. Simberloff D, Martin JL, Genovesi P, et al. 2013. Impacts of biological invasions: what’s what and the way forward. Trends Ecol Evol 28: 58-66. Clavero M and García-Berthou E. 2005. Invasive species are a leading cause of animal extinction. Trends Ecol Evol 29: 110. Bellard C, Cassey P, and Blackburn TM. 2016. Alien species as a driver of recent extinctions. Biol Lett-UK 12: 20150623. Doherty TS, Glen AS, Nimmo DG, et al. 2016. Invasive predators and global biodiversity loss. P Natl Acad Sci USA 113: 11261-65. Downey PO and Richardson DM. 2016. Alien plant invasions and native plant extinctions. AoB Plants 8: plw047. Sagoff M. 2005. Do non-native species threaten the natural environment? J Agr Environ Ethic 18: 215-36. Davis MA, Chew MK, Hobbs RJ, et al. 2011. Do not judge species on their origins. Nature 474: 153-54. Pearce F. 2015. The new wild: why invasive species will be nature’s salvation. Boston, MA: Beacon Press. 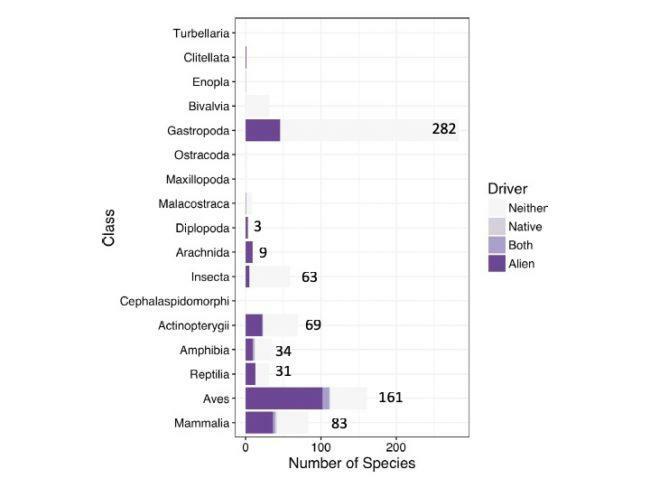 Blackburn TM, Bellard C, Ricciardi A (2019) Alien versus native species as drivers of recent extinctions. Front Ecol Approximately: 10.1002/fee.2020.